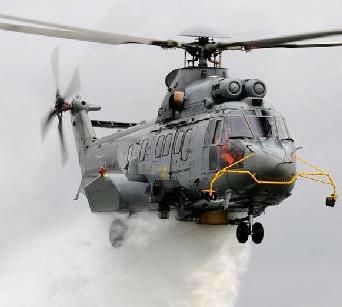 February 23, 2010 - Eurocopter develops fire fighting system for the EC225. The EC225 represents Eurocopter's latest development in the 11-tons transport helicopter segment. A new five- bladed main rotor of the Spheriflex type provides optimum reliability and lift performance. The EC225 is powered by two Turbomeca Makila 2A turboshaft engines. A full de-icing anti-icing system enhances operational effectiveness. The Fire Fighting System, which has been extensively tested during forest fires on the island of Corsica, France is one of the most effective and powerful helicopter-borne fire-fighting systems available in the market. The first operator to utilize this system is South Korea’s National 119 Rescue Service with its EC225. The EC225’s fire fighting system consists of a flexible 1056 gallon tank attached to the floor of the cabin, a scoop and water jettison kit and a system of hatches underneath the fuselage to empty the tank. The tank can be pumped full with the helicopter in hover flight. The entire system is located inside the cabin and can be assembled and dismantled in less than twenty minutes, thus assuring the helicopter’s multi-role capability as a fire-fighter, a transport aircraft as well as a medical evacuation aircraft. The trials in Corsica explored the helicopter’s entire flight envelope when equipped with the fire-fighting system. The helicopter’s flight behavior in fire-fighting configuration was tested under real-life conditions in cooperation with the Securité Civile, the French Emergency Preparedness Organization. The EC225 consistently demonstrated flight characteristics that qualify the helicopter as a unique and useful fire-fighting platform. By dropping water from a lower altitude and at a lower speed than a fixed-wing aircraft, it can target a fire with greater precision, especially in mountainous terrain. Furthermore, its ability to pump water onboard in hover mode enables the helicopter to make use of water supply points in close proximity of the disaster area. Even though the pumping of water from the sea, lake or watercourse remains an extremely delicate operation, it is nevertheless facilitated by the helicopter’s enormous power capacity. The EC225 is the latest member of the proven Super Puma/Cougar family of helicopters. With a take-off weight of 24,251 lbs (11,000 kg), the EC725/225 carries an impressive fuel load of 5,000 lbs, guaranteeing a flight time of 5 hours. In addition to new Makila 2A1 engines with a stronger main gearbox and a new five-bladed main rotor, the EC725/225 features a state of the art glass cockpit featuring six large and redundant multifunction displays. Established in 1992, the Franco-German-Spanish Eurocopter Group is a Division of EADS, a world leader in aerospace, defense and related services. The Eurocopter Group employs approx. 15,600 people. In 2009, Eurocopter confirmed its position as the world’s No. 1 helicopter manufacturer in the civil and par public market, with a turnover of 4.6 billion Euros, orders for 344 new helicopters, representing an order intake of 5.8 billion euros and a 52 percent market share in the civil and par public sectors. Overall, the Group’s products account for 30 percent of the total world helicopter fleet. Its strong worldwide presence is ensured by its 18 subsidiaries on five continents, along with a dense network of distributors, certified agents and maintenance centers. More than 10,500 Eurocopter helicopters are currently in service with over 2,800 customers in more than 140 countries. Eurocopter offers the largest civil and military helicopter range in the world.